Time that drags is ample time to commit to El Bloggo! And here we are, with the 3rd and final installment of the Boston Road Trip Extraordinaire. That Saturday was supposed to be spent waking up leisurely, having breakfast, and heading to the nearby Mashpee Commons Mall to visit Cupcake Charlies and grab a dozen (YES – certain allowances are made for dessert! ), before heading to Salem, Massachusetts, for the Bewitched After Dark walking tour. We had just finished our leftover Halal Guys for breakfast when hubby plugged the address of the tour into his phone. Alas, it was 2.5 hours away, not 1 hour like I had thought (I was referencing the point from Boston to Salem, and we were situated 1 hour away from Boston as it was). It was already 10:30 am, so we hauled asses to the Red Van and, after grabbing the requisite Dunkin’ Donuts coffee (it doesn’t come CLOSE to Timmy’s, in my opinion), sped off towards Salem. We arrived at nearly 1:00 pm on the dot, at the door of the Bewitched store, where we met our tour guide. If you’re looking for spooky stories and haunted houses, this is not your tour! Though not scary by any means, it was fascinating and informative. We started off viewing houses in which murders had occurred, and then walked through a graveyard where victims of the Salem Witch Trials were buried. Sadly, the majority of women died because of false accusations. I won’t ruin the experience with too many details, but I think it’s a fascinating look back in history and highly recommend it. 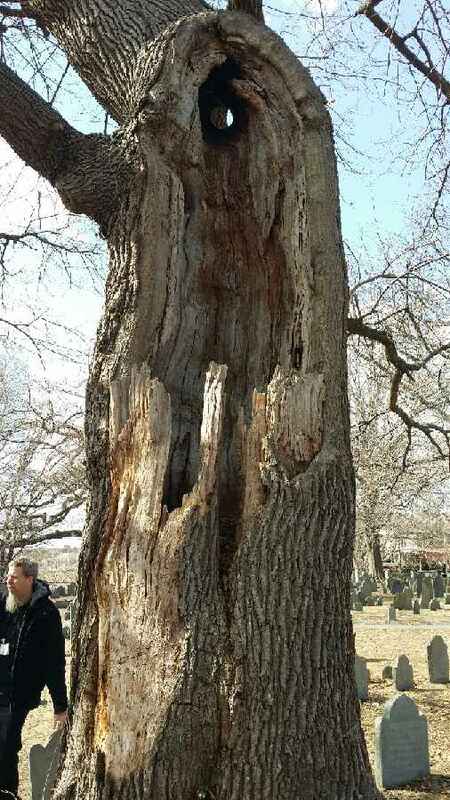 Also, there’s a tree that apparently gets struck by lightning every few decades. Exciting! Salem is a beautiful town. We smelled some heavenly food and longed to stay a while longer to dine, but were to head immediately to Fenway Park for our 2nd tour of the day. We zip back onto the road and towards the big city of Boston, park, and get all excited for the tour, until…. Tours are fully booked today. Please come back tomorrow morning. We try instead to find something good to eat near Fenway, and end up walking for an hour unsuccessfully. Bo-ring and unexciting food options (not to mention the surplus of green- and scantily-clad youth in celebration of St. Patty’s Day which was also that weekend)! Instead, we drive nearby in search of P.F. Chang’s, which is located inside the Prudential Building in (downtown?) Boston. After discovering the 1+hour wait time for both P.F. Chang’s and the Cheesecake factory, we settle for pizza and other food-court delicacies, Crumbs cupcakes, and frozen yogurt/ smoothies instead. And it all worked out, because the next day we were up bright and early, one of the first groups in line to get tickets, to behold the wonders of ‘ole Fenway and its rich, deeply-rooted history. I loved Boston. I will be back. And next time, I won’t be leaving without a lobster dinner (or three)!